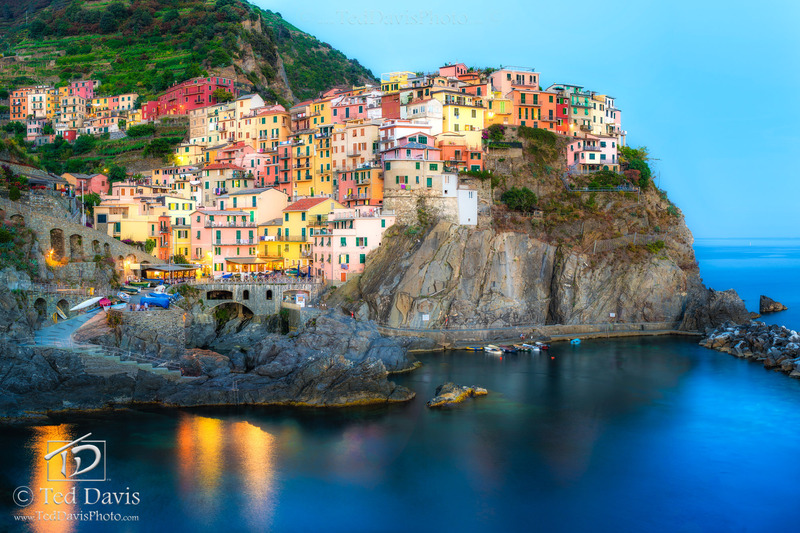 As dusk settled into night, I was perched on the edge of the cliff overlooking Manarola. The blue hour was deepening and I began adjusting my shutter speed – first it was at 6 second, then 8, 10. I had photographed Manarola before, but never with such a fantastic blue water and sky stretching to the horizon. With not a cloud in sight, I snapped a slow exposure of this beautiful town – relaxing for a moment as the responsibilities of life drifted away. Cinque Terre at its finest, enjoying a beautiful evening on the Italian coast. Photo © copyright by Ted Davis.